I have the 12 inch and 18 inch. So convenient. I need more!!! The best solution we've found for supporting peonies. Stronger than other products, very easy to assemble, and flexible with respect to size as plants get larger. Love these garden stakes! Nice and sturdy and best part, can adjust to fit your needs. 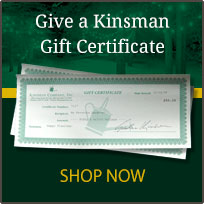 I have purchased many different plant supports from Kinsman and other companies. But I needed some straight stakes to keep my Lucifer Crocosmia off the flowers in front of them. These are perfect for that application. I am very pleased with these stakes. I have recommended these to a friend of mine. And will do so in the future. I got these to hold my Lucifer Crocosmia up as they were laying over on the flowers in front of them. I have many Kinsman border supports in two sizes, but I needed something that is straight. These are perfect for the job at hand. Very pleased. JUST WHAT I WAS SEARCHING THE WEB FOR !!!!! I DID NOT WANT TO USE WOOD STAKES WITH TWINE. 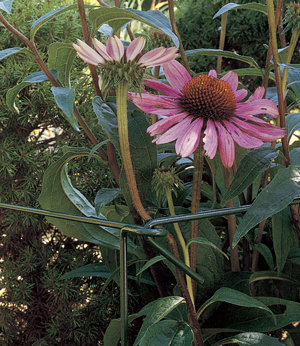 we have tried many plant supports over the years and these are the absolute best. They do their job and you don't even know they're there. They blend in beautifully with the foliage. The stakes blend in well with the plants. I wish that they were taller.